Microsoft Windows Media Player is a popular multimedia software that comes with Microsoft Operating System. It can play various media formats such as .avi, .cda, .mpg, .mid, .mp2, .mp3, .mp4, .wav, .wma, etc. You can see the supported file formats at Information about the Multimedia file types that Windows Media Player supports. But even you have the latest version of Windows Media Player, it sometimes may requires you to download additional codecs on the Internet. By default, Windows XP comes with Windows Media Player 9. Sometimes, it has a problem when playing media files. But most cases always be solved by update the Windows Media Player to the higher version. If you regularly play media files on the computer, you would need to update Windows Media Player to latest version. If you’re going to install only a single computer, it would be fine. You can download the latest Windows Media Player setup file (.EXE) and then run on the computer and you are done. But what if you have to update more than 10 computers (in a corporate for an example). That would takes time and inefficient way to install Windows Media Player on each computer manually. To solve the problem, you can deploy Windows Media Player using group policy or SMS. But these ways require that all computers must be in the domain not workgroup environment. 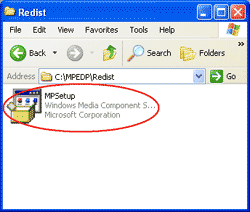 In this article, I’ll focusing on deploy the Windows Media Player using Group Policy only. To deploy Microsoft Windows Media Player through Group Policy, you need to make the Windows Media Player setup file (.EXE) to Microsoft Installer (.MSI) package file. The advantage of .MSI package is that you can deploy it through Group Policy or SMS and also it can do silently installation which means that there is no user interface interaction show up when installing the software. 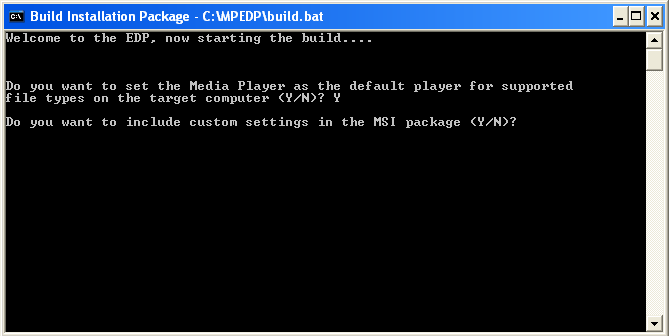 Microsoft already provided a tool to create Microsoft Installer (.MSI) package for Windows Media Player. It’s called Enterprise Deployment Pack (EDP) for Windows Media Player. But currently (the time I wrote this article), EDP is support for make .MSI package of Windows Media Player 9 Series and Windows Media Player 10 only. Windows Media Player 11 isn’t support yet. So I’ll show how to deploy Microsoft Windows Media Player 10 using Group Policy. And in this part, let see how to make an .MSI package file of Windows Media Player. Download Enterprise Deployment Pack (EDP) for Windows Media Player from Microsoft. Double-click mpedp.exe to run Enterprise Deployment Pack (EDP) for Windows Media Player. Click Yes to continue. Click Yes to accept License Agreement. 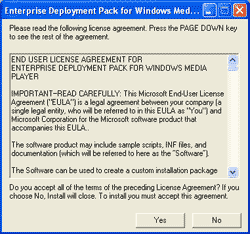 Select path to install Enterprise Deployment Pack (EDP) for Windows Media Player. I leave it to default location (C:\MPEDP). Click OK. The setup is complete. Click OK.
Before run Enterprise Deployment Pack (EDP) for Windows Media Player, go download Windows Media Player 10 from Microsoft and rename it to MPSetup.exe and place it in C:\MPEDP\Redist. This is going to be the source file for making MSI package. Next, open Enterprise Deployment Pack (EDP) for Windows Media Player. 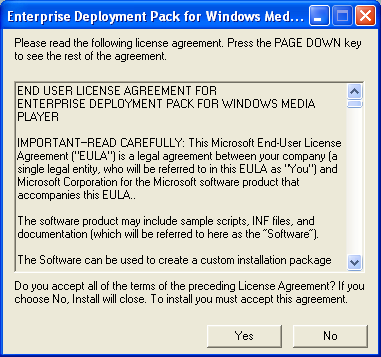 Click Start -> Programs -> Windows Media -> Enterprise Deployment Pack. 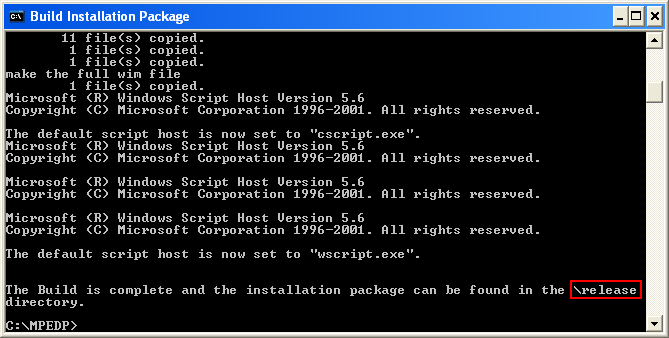 The Build Installation Package wizard starts up. Type Y to set Windows Media Player as a default player. Next, it asks you to include custom settings in the MSI package. I don’t want any complexity for now so type N.
Now the wizard is making .MSI package. Wait a few minutes. When the wizard has finished, it tells that the MSI Package is in \Release folder. 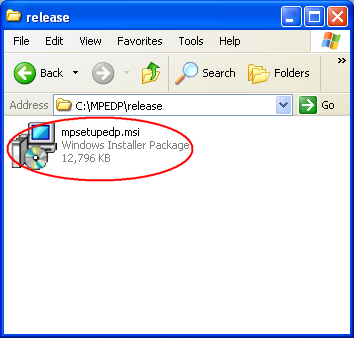 Open C:\MPEDP\Release folder, you’ll see the Windows Media Player 10 MSI Package. 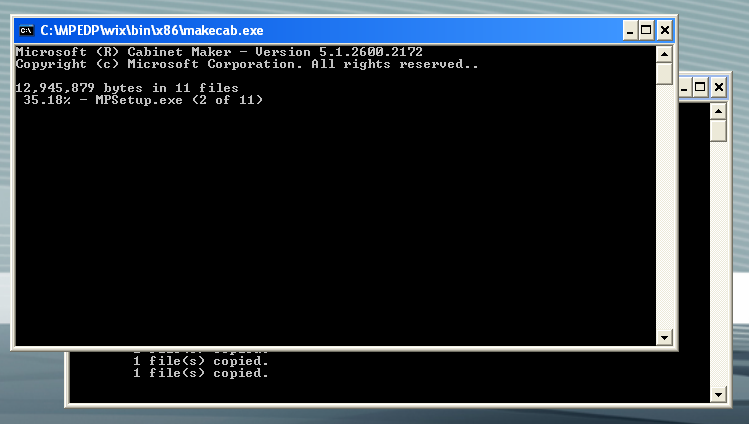 I’ll use this file to deploy it through Group Policy in the next part.